Guajillo are one of the most popular chilies in Mexico. 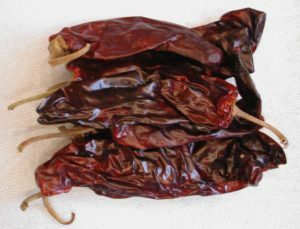 Most of the guajillo chilies are grown in the drier climate of north central Mexico. Guajillo are usually dried, and are used in hot sauces, and for pigment. It is a larger chili with a thicker skin, medium heat, and reddish brown in color, guajillo chilies do come in a number of other forms besides whole dried chilies. You can find them whole, dried whole, ground, powdered, granulated, julienne, diced, de-stemmed, or rendered into a paste. Guajillo, Ancho, and Pasilla together are referred to as the Holy Trinity of Chiles. Guajillo are rated at 2,500-5,000 Scoville units.